A light-duty stapler ideal for quick and easy stapling anywhere. Uses standard size 24/6 & 26/6 staples and attaches up to 20 paper sheets. Made of metal, padded with solid ABS-plastic for better grip and comfort. Its small and compact built allows ergonomic handling using either 1 or 2 hands. Choose color between black, blue and orange. See available colors above. ➤ 3 Desk Staplers. Size: 5.2" x 2" x 1.3". Weight: 7.8oz. How does the Top Quality Guarantee work? let us know about the issue. We will assist you within one day. Go to the top of this page to grab your Desk Stapler Set now and get started. 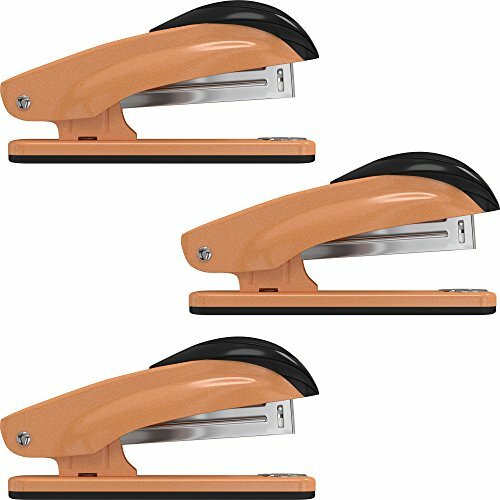 Desk Staplers intended for office, school and home use. Easy to use thanks to its small, compact and ergonomic design. Uses standard size 24/6 & 26/6 and staples up to 20 paper sheets. Package includes: 3 Desk Staplers and 1000 complimentary staples (bullets). Your purchase is protected by our Top Quality Guarantee & 1 Year Warranty. If you have any questions about this product by desired tools, contact us by completing and submitting the form below. If you are looking for a specif part number, please include it with your message. Stapler, Binder Clip Or Paper Clip - The No Slip Clip - A New Exciting Reinvention to Clasp & Fasten Documents Or Reports of 2-50 Pages Perfectly - 40 Multi Colored Clips Included and Reusable!